If you work in or near downtown Raleigh, there are so many dining options that it’s easy to feel overwhelmed. Let me help. Start eating at Sitti once a week. The healthy options will make you feel good about your decision to dine out, while the freshness of the meal will keep you coming back. I am a huge fan of baba ghanouj (bah-bah guh-noosh), a dip made from roasted eggplant, olive oil, tahini and spices. 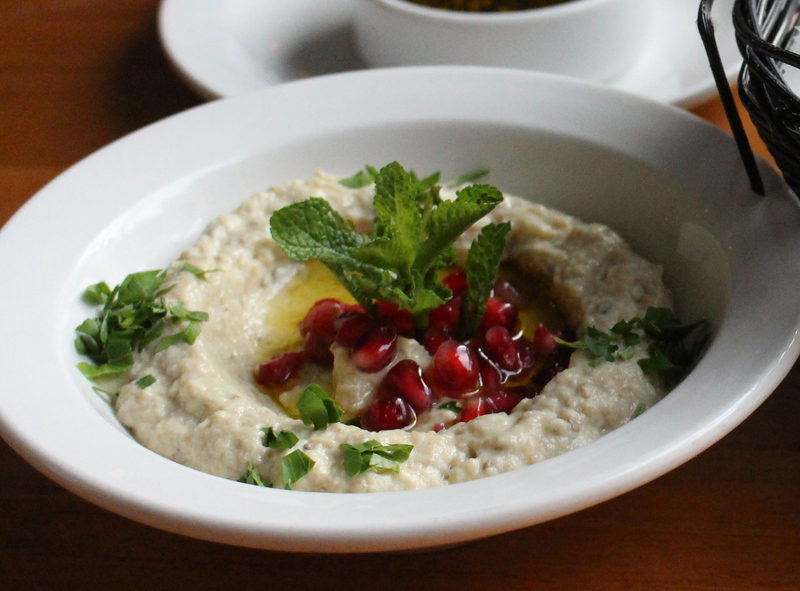 Sitti’s version of this dish is garnished with pomegranate seeds and bursting with freshness. Along with the restaurant’s warm pita bread, this could be a meal! My friend ordered the goat cheese & orange salad. It was full of fresh fruit, goat cheese and walnuts. This is what I would have ordered too, but I didn’t want to get the same thing – I wanted to be adventurous! 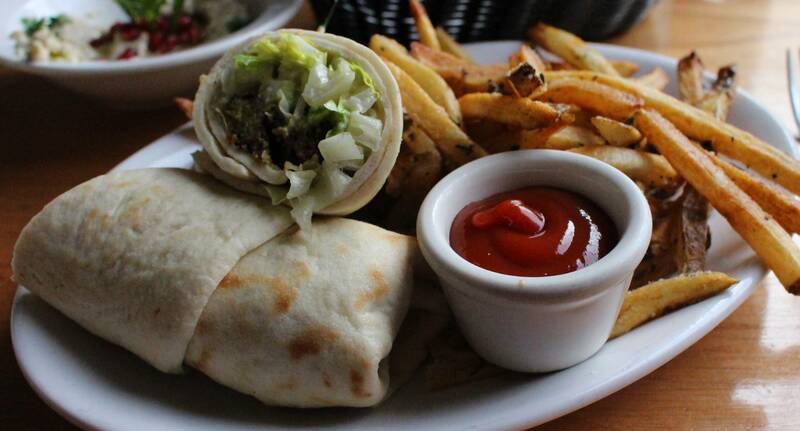 I ordered a falafel wrap, but the real star of this dish was the deliciously seasoned french fries. The fries are seasoned with thyme, parsley, sea salt and olive oil. Is your mouth watering too? Falafel Wrap – crushed chick peas, seasoned and fried, with lettuce, tomato and tahini sauce. Sitti has a selection of appetizers, sample platters, wraps, salads, kababs and flatbreads. 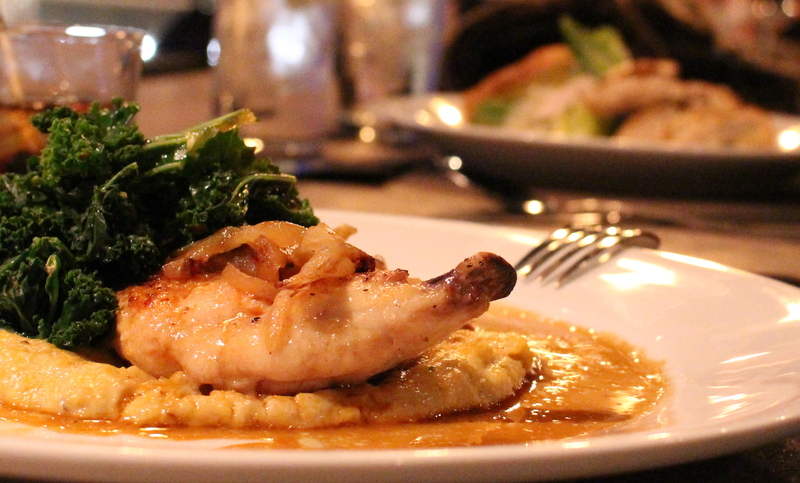 Take advantage of their special deals during Triangle Restaurant Week. “Globally Inspired. Locally Produced.” That is the motto and exactly what you will find at Plates Neighborhood Kitchen, a new restaurant in the Glenwood South neighborhood near downtown Raleigh. Plates opened November 1st and you will need to make reservations if you plan to go during the weekend. The atmosphere is comfortable and welcoming. The food is elegant yet the prices are reasonable. The servers and bartenders are helpful and friendly. What more could I ask for? I went with two friends on a Friday night and we did not have reservations but luckily there were three seats open at the bar. The bartenders were very personable and we had a great evening. I started out with a lavender julep which was carefully made and thoroughly enjoyed. 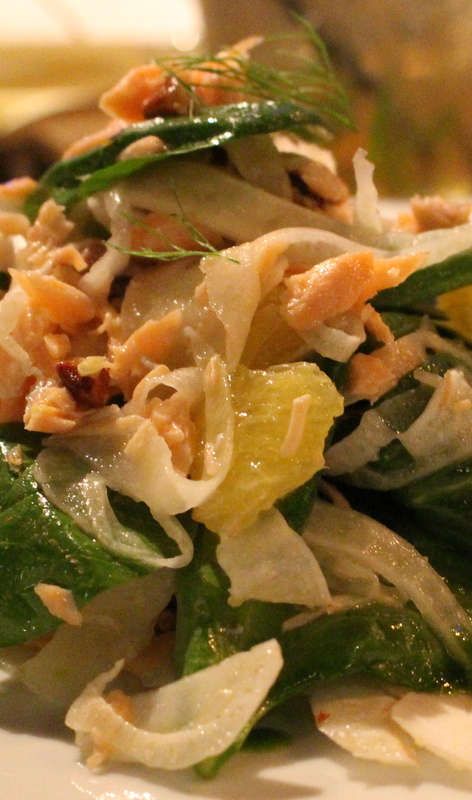 For dinner I ordered a smoked salmon and leek salad with a citrus vinaigrette. I would definitely order it again! My friend ordered chicken with grits and kale. He especially enjoyed the grits and finished every last bit. For dessert, I saw that Plates had a persimmon creme brûlée. I don’t usually eat creme brûlée but I love persimmons, so I ordered it. I also tried some port with my creme brûlée. It was a perfect dessert. The menu changes often because Plates uses fresh ingredients that they try to source locally whenever possible. You can expect local food with an international inspiration, served by friendly people. The menu provides just a few options which is nice because you won’t be overwhelmed with choices. Until it comes to dessert… chocolate chess pie, creme brûlée, sticky toffee pudding and cheesecake. Check out the New Year’s dinner menu at Plates. I hope you enjoy Plates as much as I did. 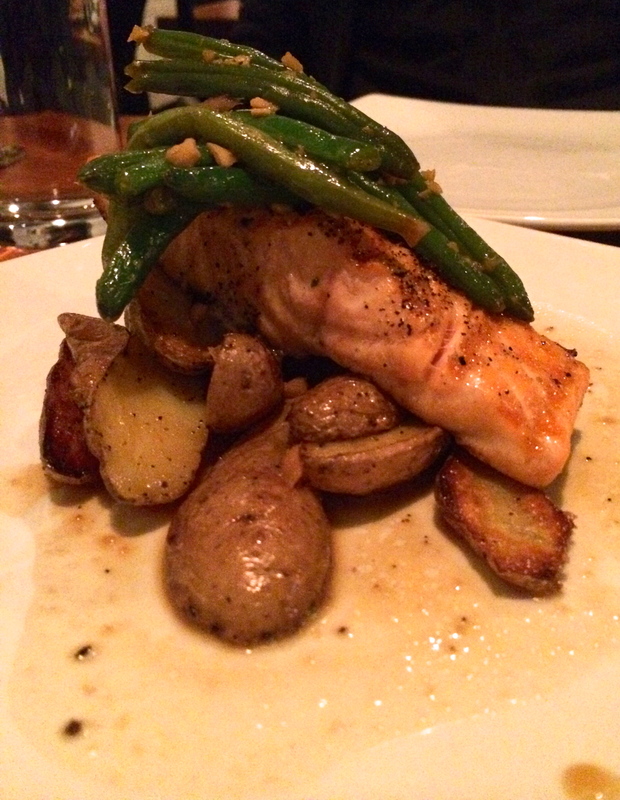 We went with the grilled salmon, and it ended up being a great choice. 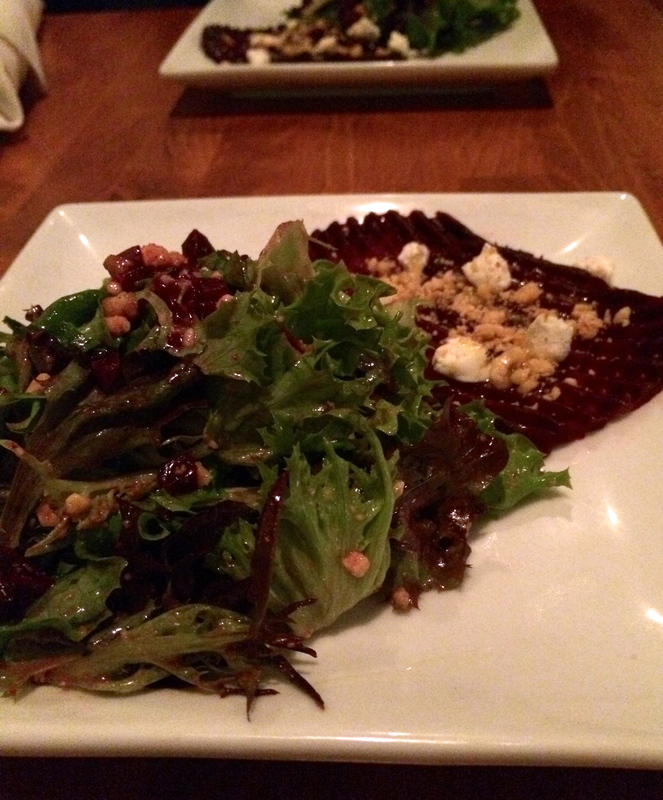 The photo above is a half-portion, but with the salad, it was just the right amount of food. We got our salmon cooked medium, as our waiter suggested. It was crispy on the outside and tender on the inside. With the description of “fingerling potatoes,” I was expecting a heap of fried potato strings. I was pleasantly surprised with the healthier option of large cuts of sautéed potatoes. I would definitely get this dish again! Bonus: Venable has a lot of vegetarian and vegan options! And check out their brunch menu…so many delicious options! I hope I’ve sold you on this wonderful restaurant! It is a great place to eat dinner before checking out a show at DSI Comedy or enjoying a local band at The Station. I used to drive past Guglhupf three times a week on my way to an internship. I drove past it for months before trying it because by the time I would get off work, it was closed. Once I finally went there, it became one of my favorite cafes in the Triangle area. The unmistakeable European feel will put you at ease and allow you to make new friends out of strangers. The cafe is spacious, with plenty of outdoor seating and two floors inside. The adjoining bakery emits the delicious smell of freshly baked bread out onto the patio area. If the weather allows, sit outside and enjoy a sandwich or a snack like you have no where else to be. I visited Guglhupf before Thanksgiving to spend some quality time with my friend Liat. It has become somewhat of a tradition for us after I took her there for the first time last year. I don’t usually stray far from my favorite item on the menu, a turkey, brie and apple chutney sandwich. However, this time I got something a bit different, a turkey, grilled pear and gorgonzola sandwich. The sandwich was heavy on the turkey, but the strong flavors of arugula and gorgonzola cheese complemented the sweet, grilled pear. I still prefer the turkey, brie and apple chutney sandwich, but this one is a close second. 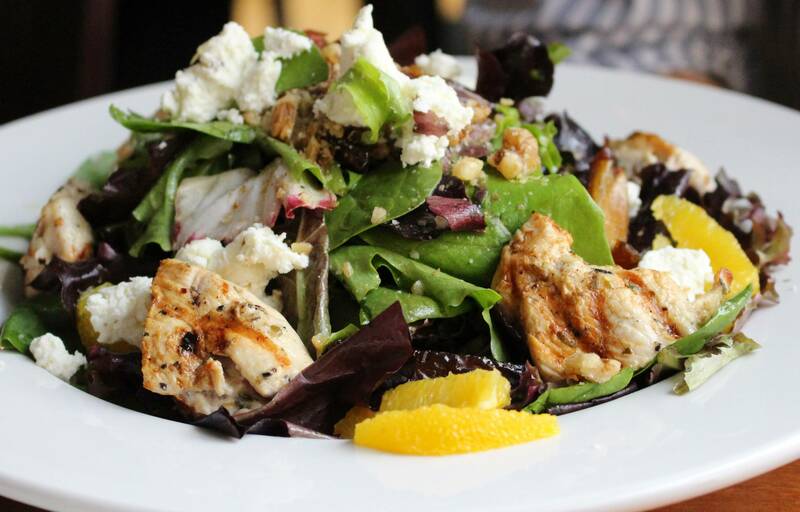 Guglhupf also has an assortment of small plates and salads. Liat got what she always gets – the strawberry tart. I have yet to try it because the sandwiches always fill me up. The menu is not large but there is an option for everyone, whether you are craving a hearty soup or something sweet. After, or even before, going into the cafe, check out the bakery. I dare you to walk out without trying anything. <p style=”text-align: left;”>Saturday night I went to <a href=”http://www.vinrougerestaurant.com/” target=”_blank”>Vin Rouge French Bistro</a> to specifically try the steak-frites. I just had an amazing experience in Paris with steak frites at the Café du Commerce and I wanted to see how Durham’s offerings stacked up against the Parisians. I ordered hangar steak with bleu cheese butter. I eat my steak rare (as everyone should!!) and it was perfectly cooked. 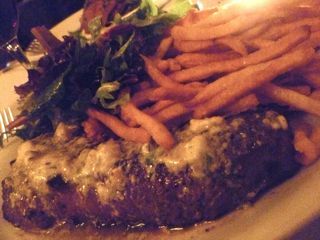 Saturday night I went to Vin Rouge French Bistro to specifically try the steak-frites. I just had an amazing experience in Paris with steak frites at the Café du Commerce and I wanted to see how Durham’s offerings stacked up against the Parisians. I ordered hangar steak with bleu cheese butter. It was absolutely delicious. I eat my steak rare (as everyone should!!) and it was perfectly cooked. I couldn’t finish it (I had ordered the porc rillette for an appetizer because I have tasted Chef Matt Kelly’s rillette before and couldn’t help myself) and the leftovers were as good the next day for lunch. I only wish that I’d had some more frites… I ordered a carafe of Éric Texier 2008 Côtes du Rhône red and was very happy with that choice, too. When you are in the mood for excellent steak and hot crunchy fries, head over to Vin Rouge on Hillsborough Road! You won’t be sorry. By default, Thesis uses the title of your post as the contents of the <title> tag. You can override this and further extend your on-page SEO by entering your own <title> tag below. Entering a <meta> description is just one more thing you can do to seize an on-page SEO opportunity. Keep in mind that a good <meta> description is both informative and concise. Like the <meta> description, <meta> keywords are yet another on-page SEO opportunity. Enter a few keywords that are relevant to your article, but don’t go crazy here—just a few should suffice. From time to time, you may wish to keep a particular post or page from appearing in the search engines. Checking this box will add the noindex robot meta tag to this page, thereby preventing it from being indexed in the search engines. If you use <!–more–> within your post, you can specify custom “Read More” text; otherwise, whatever is set in the global Thesis Options will be used. If you want to style this post individually via CSS, you should enter a class name below. Note: CSS class names cannot begin with numbers! To add a post image, simply upload an image with the Add an Image button above, and then paste the Link URL here. If you like, you can also add your own alt text for the image in the appropriate field below. Based on the current width of your content column, the maximum width for post images is 695 pixels. Based on your content width and current font size settings, the maximum width for framed post images is 671 pixels. Finally, there are certain areas around the theme where full-size post images cannot be displayed. In this case, Thesis will automatically crop your post image into a thumbnail with default dimensions as specified on the Thesis Options page. If you like, you can override this (on this post only) by specifying your own thumbnail dimensions below. Please note that automatic thumbnail generation requires your image to be hosted at www.eatitnorthcarolina.com. If you like, you can supply your own thumbnail image. If you do this, the new thumbnail image will not be cropped, so make sure that you size the image appropriately before adding it here. If you’ve supplied a post image for this post but have not supplied your own thumbnail image, Thesis will auto-crop your post image into a thumbnail. The resulting thumbnail will be cropped to the dimensions specified below. If you’d like to change the default crop dimensions, you can do so on the Thesis Options page. Even if you have the multimedia box disabled by default, you can display any custom image you like in the box on this particular post. To accomplish this, simply upload your own image or use the Add an Image button above, and then paste the image Link URL in the field below. Like the image box above, you can override your multimedia box settings and display any video you want on this particular post. Upload a video using the Add Video button, and then paste the video embed code in the box below. Also, please note that you may need to change the width and height attributes of the video in order to make it fit perfectly inside your multimedia box. If you want to get really fancy, you can inject your own custom HTML into the multimedia box on this post by entering your code in the box below. Real ninjas do it with hooks, and if you want to add some amazing functionality to the multimedia box on this post (with PHP, perhaps), check the box below. Also, if you’re already using the multimedia box hook by default, there’s no need to check this box. A few weeks ago, I was invited for a tour and tasting at the newly renovated Darryl’s Wood Fired Grill in Greensboro off of High Point Road. I hadn’t been to a Darryl’s since I was a child but the memories but I still remembering hitting it up with the family after a Greensboro Hornets baseball game. I had read about the $2 million worth of renovations that the building underwent but I hadn’t had a chance to see it first hand yet. Needless to say, I was pretty excited. It was my first invitation to a restaurant to come check out select menu items because of my work on Eat It, North Carolina but I think I was more excited about eating at Darryl’s again. It was 4:30 p.m. and the place was already buzzing. As I walked in, I was greeted with a warm welcome from the fire pits and friendly smiles from the entire hosting staff. I told one of the hostesses that I was meeting Jeff, the Chief Culinary Officer, and Brock, the beverage manager, for a tasting. She spoke into her mic and Brock was there in about 30 seconds. The entire Darryl’s staff is extremely organized and work together seamlessly to make sure that everybody has a great experience when they are at Darryl’s. 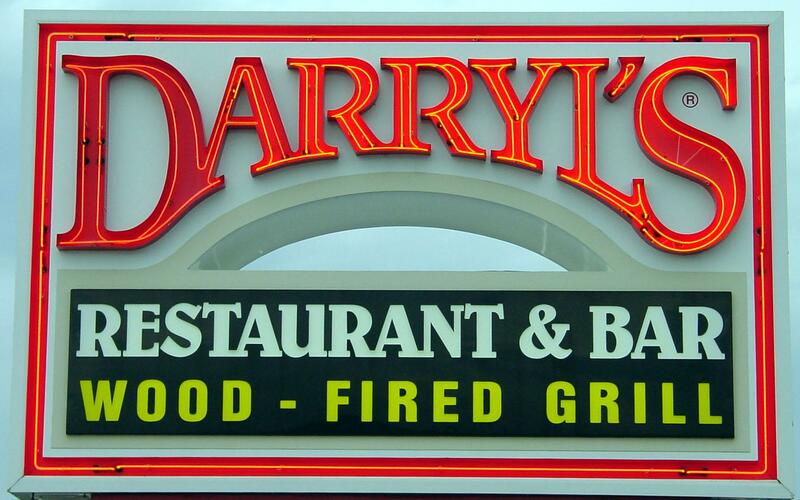 When you eat at Darryl’s, you don’t just have one person looking out after your table. You will be helped by an entire crew as they make sure that everything is how you want it. I have a lot of fond memories of restaurants that I went to as a child like my favorite Chinese restaurant in High Point that is now closed down or the place that my dad used to take me after every little league baseball game that filed for bankruptcy last year. When a restaurant that you love closes down, it leaves a void that is tough to fill and can sometimes be irreplaceable. 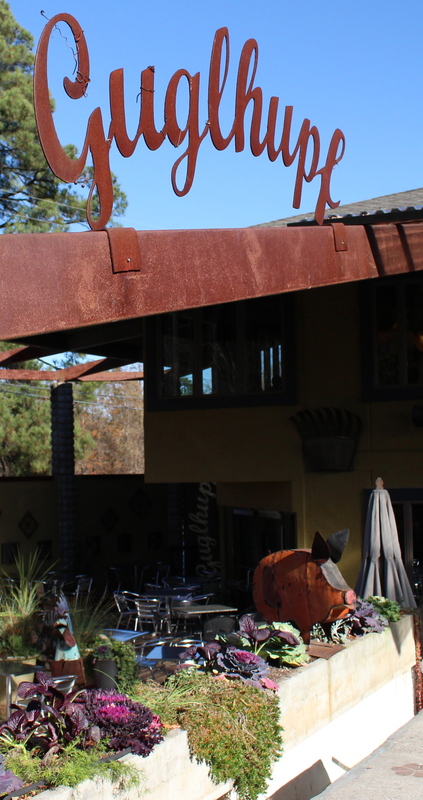 In 2002, a lot of North Carolinians experienced the same thing when the Houlihan’s Restaurant Group filed for bankruptcy in January closing the doors to twenty-five of the Darryl’s restaurants in the thirty-nine restaurant, multi-state franchise in a single day. Over the next few years, the number of restaurants dwindled down to the one remaining in Greensboro on High Point Road. 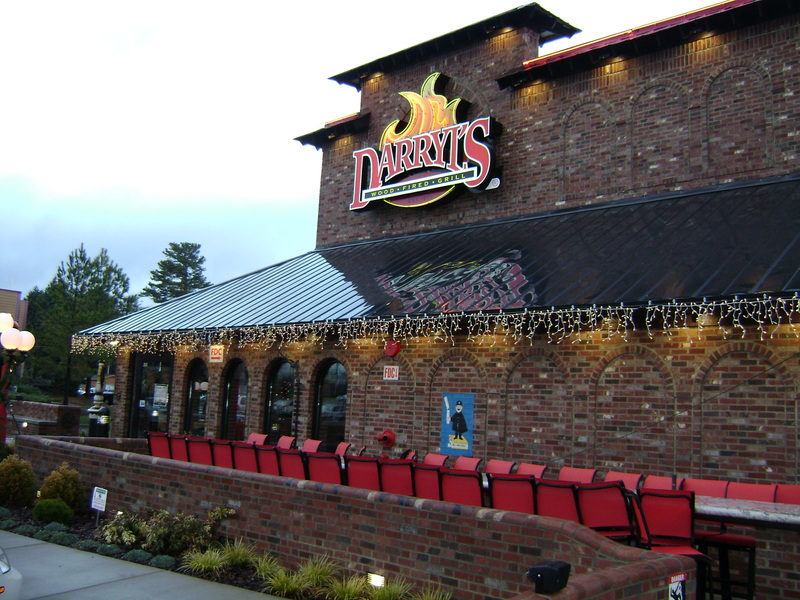 William “Marty” Kotis III and his company, Kotis Properties, decided to invest in resurrecting the Darryl’s restaurant on High Point Road in Greensboro after meeting with the Houlihan’s Restaurants Inc. CFO/CDO in late 2008. Kotis was interested in buying the piece of property because of its great location when he found out that it was the last remaining Darryl’s. He admitted “there was a part of [him] that didn’t want to see the chain disappear. [He] didn’t want to see that legacy disappear, and neither, [he suspected] do the thousands of customers and employees that have frequented Darryl’s doorsteps” in the past.